When Fantasy Flight Games released The Curse of the Dark Pharaoh in 2006, they were still trying to find out how they wanted to expand Arkham Horror. This original expansion was fun, but as the expansions started piling up, it had become one of the hardest to integrate with the rest. With this revised version, FFG hoped to make the Dark Pharaoh mesh in with everything else. I think they succeeded; this revised version is a lot of fun, and (in my opinion) much improved over the original. Great new location and Mythos cards. The writing is great, the “cursed Egyptian museum” theme is great, and the encounters are generally challenging and fun. Some of the Other World and Mythos cards in particular are just crazy, in a good way. The changes made from the original are all improvements too (well, most of them…see the next section for more). Exhibit Encounters and Items. Pure awesomeness. This is one area where the revised edition shines over the original. The Exhibit Encounter token starts near Miskatonic University and lets investigators have an encounter in the street. After each encounter (regardless of the outcome), the token moves elsewhere in Arkham. The Exhibit Encounters are great — creepy and evocative, and give something to do in the streets! They often reward investigators with cool items from the exhibit (which are all pretty well balanced). Neighborhood Patrols. Sometimes bad things happen in a neighborhood, resulting in the citizens banding together and guarding their homes. These tokens make it harder for the investigators to move around, but are removed from the board every time the terror level rises. The patrols replace the old Barred from Neighborhood tokens, which were a pain in the neck and don’t feel as “right” thematically as the patrols do. Allies and spells. All are new spells and allies are great: not too overpowered, all work with the expansions overall theme, and are a blast to use. Was this necessary? I know a few people that outright refuse to buy this, since, as they put it, “they already bought it five years ago.” As much as I really like the revised version of this expansion, I understand why some are grumbling. I’m glad I bought it, but it isn’t essential, especially if you have the original. Some revised cards lose flavor. In updating all of the cards, a few Arkham encounter and Mythos cards loose the thematic punch they once had, trading it to make it mesh well with the other expansions. Some folks on other board gaming sites have made a combined version of the two Dark Pharaoh expansions, keeping a few of the older cards for this reason. While I don’t plan on doing that, I agree that a few of the text/rules changes were flavorless. Dark Pharaoh herald. The Dark Pharaoh herald, previously released as a free download from FFG’s website, is included in the expansion. It’s a cool herald in some ways, but man…it makes the game brutally hard (especially if Nyarlathotep is the Ancient One). Almost too brutally hard. The most punishing traits of this herald involve sanity loss every time an investigator gains a Unique Item (even at set-up! ), and the high chance that investigators may gain a curse (and subsequently lose stamina) every time they gain an Exhibit Item. Using this herald is an easy way to ramp up the difficulty, that’s for sure. While I liked the original Dark Pharaoh expansion, I think the new one is an improvement. All of the neat bits of the original are kept or tweaked to work better, and the next stuff is great overall. It might not be a must-buy item if you have the original, but I’d recommend it…and if you DON’T have the original expansion, it’s definitely worth getting. When I bought Curse of the Dark Pharaoh, it had already come in the revised edition, so I can’t compare to the original. The revised box is a good small box expansion for Arkham, easily on par with the others in the game line. Like the other small box expansions, the theme of this expansion centres around a Herald, the Dark pharaoh (obviously), one of Nyarlathotep’s Masks. The Exhibit Items and Ancient Whispers: These are a fun addition to the game, kind of a wandering encounter location with a chance to gain some artifacts that can help you in your struggle with the Mythos. The only downside to the Exhibit Items, in my mind, is that oddly they are best in games in which the Pharaoh is NOT the Herald, and not really worth it when he is. The Cards: There are some fun cards for various decks, as well as Benefits and Detriments, which flesh out the expansion nicely. Like most of the expansions in Arkham Horror, these are enjoyable little add-ons that introduce some new aspects to the decks, which keeps the game fresh and diverse. The Curse of the Dark Pharaoh (CotDP) is the first small box expansion for Arkham Horror. The Revised Edition made some changes to the text on a few cards and also added a Herald. CotDP is centered on the mysterious living curse that is the avatar of the Great Old One Nyarlathotep. In addition, the “Legacy of the Pharaohs” exhibit has come to the Arkham Museum of History cursing all those who interact with it. The investigators must stop the evil Dark Pharaoh if they are to have a chance at defeating the Great Old One. The quality of the expansion components is on par with the base game and very good. There are thick cardboard playing pieces and fairly durable cards with very good artwork. The expansion rules are 2 pages and pretty straight forward. No complaints about the components. This expansion includes additional location, Mythos, Gate and Spell cards to beef up their respective decks. Also included are Exhibit Encounters and Exhibit Items. Set-up for Arkham Horror is not made more difficult or longer with the inclusion of the CotDP expansion. The expansion cards are simply shuffled into their respective base game deck. The Exhibit Encounter and Exhibit Item decks are shuffled and set aside. The Ancient Whispers marker is placed on the Miskatonic University street area. Quick and easy! The exhibit encounters adds another mechanic to the game. 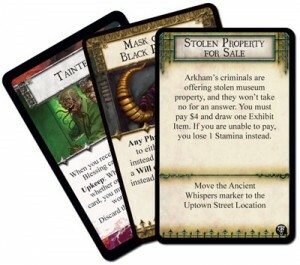 Investigators have an exhibit encounter in the Arkham Encounter Phase when they are in the street area that contains the Ancient Whispers marker. An exhibit encounter gives the investigator a chance to obtain some situational but cool exhibit items. The Ancient Whispers marker moves to another location at the end of the encounter. If no investigator has an exhibit encounter, then it moves during the Mythos Phase as though it were a monster with the moon dimensional symbol. This is a fiddly mechanic and I admit that I often forget to move the Ancient Whispers marker during the Mythos Phase. The CotDP expansion is possibly the least favorite expansion among Arkham Horror players simply because it does not offer much and the Herald isn’t all that good. However, this expansion is extremely easy to incorporate into the base game and does have some bright spots. There are a ton of very useful spells and exhibit items, and some good allies in this expansion. Spells such as Markings of Isis, Plague of Locusts, Astral Travel and Feeding the Mind come in handy. The exhibit items, such as the series of masks, tend to afford the investigators more flexibility in using their skills or resources. I also like the Elder fragments which are somewhat less powerful Elder Signs. Overall, I would have liked the exhibit items be a little more powerful. I would have also liked more permanent items instead of the many use and discard items. Allies such as Erica Carlyle, David Packard and Dr. Ali Kapour can really boost investigator skills. The big downside to this expansion is the herald. The designers should have thought this one through a bit more. The Dark Pharaoh Herald discourages players from using the main component of the expansion because it curses any investigator which gains an exhibit item. Since a cursed investigator is virtually useless in the game, players tend to avoid having exhibit encounters at all costs. In addition to doling out curses, this herald also makes investigators lose sanity and/or stamina on a regular basis. It makes for an extremely difficult game. On a side note, the Miskatonic Horror expansion contains many new Exhibit Encounters and a few powerful Exhibit Items. They are worth giving some plays. The Curse of the Dark Pharaoh Expansion for Arkham Horror is a not a must have expansion but would still make a fine addition to your Arkham Horror collection. The exhibit encounters are a new mechanic that could change things up a bit when used from time to time. This is a very neet little expansion. The game mechanic it adds to the game are very simple but quite fun. The best part is that it lets you have encounter in some streets. 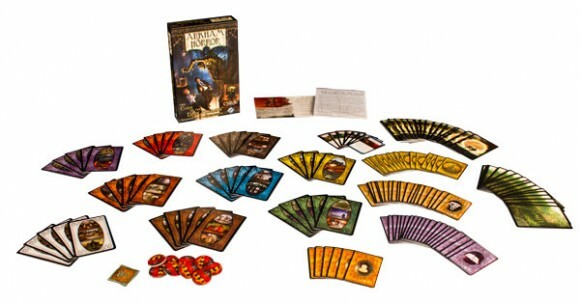 If you are a huge Arkham Horror Fan like me, you will need to get this. Add a Review for "Arkham Horror: Curse of the Dark Pharaoh (Revised Edition)"